It’s literally the hottest new trend winning over the fitness fashion-forward. The Zaggora HotPant is part of a clothing line that claims to help you burn more calories by making you not only look, but also feel hot. ABC News’ Juju Chang visited Zaggora’s founder, Dessi Bell, a 28-year-old investment banker turned workout guru, to give the pants a try.”You can actually burn more calories by just wearing these clothes?” Chang asked.”Because it makes you hotter,” Bell replied. “The body burns more calories when you get hotter.”According to Bell, these pants will make you sweat while helping you melt off those extra pounds.”Our biggest market is moms, and moms are great because once moms get behind a product, they tell all their friends,” Bell said. 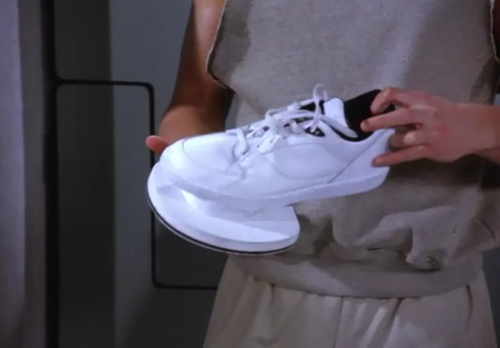 Jimmy Training Shoe sold separate. This entry was posted on January 17, 2013 at 8:16 am and is filed under Uncategorized. You can follow any responses to this entry through the RSS 2.0 feed. You can leave a response, or trackback from your own site.